People are opening up their boxes of G-BT08, so it’s time to see those commons and rares! We’ll update as new cards start making their way out. Edit: A whole bunch of cards! AUTO R: [CB1, choose 1 card in your drop zone, and put it on the bottom of your deck] During the battle this unit boosts a rear-guard with the Revelation ability, if that attack hits a vanguard, you may pay the cost. If you do, choose 1 rear-guard that this unit was boosting, and return it to your hand. (AUTO?) GB1: [Put this unit on the bottom of your deck] When this card is put into the drop zone from your soul, you may pay the cost. If you do, choose (1?) of your rear-guards, and Stand it. AUTO V GB1: [CB1, choose 1 of your rear-guards, and retire it] When this unit attacks or is attacked, you may pay the cost. If you do, for this battle, this unit gets Power +1000 for each card in your soul with “Nightmareland” in its card name. CONT R GB1: If you have a “Dee of Nightmareland” in your soul, this unit gets Power +2000. AUTO R: When this unit attacks a vanguard, for that battle, this unit gets Power +2000 for each “Dum of Nightmareland” in your soul. ACT R GB1: [Rest this unit] Choose 1 of your vanguards, until end of turn, it gets Power +1000 for each card in your soul with “Nightmareland” in its card name. AUTO: When this unit is put into the drop zone from R, SC1. Then, if it is your turn, choose 1 of your “Nightmareland” units, and that unit gets Power +4000 until end of turn. 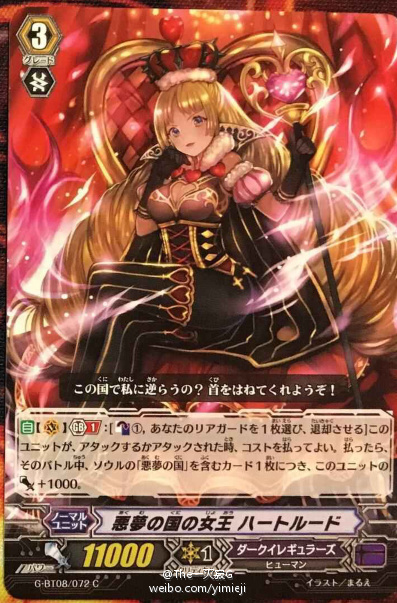 ACT R GB1: [Put this unit into your soul] If you have a vanguard with “Nightmareland” in its card name, choose up to 1 of your units, and that unit gets Power +1000 for each card in your soul with “Nightmareland” in its card name until end of turn. If the unit you chose with this effect was “Dum of Nightmareland”, draw 1 card. AUTO: [Choose 1 card from your hand, and discard it] When this unit is placed on R, if you have 4 or more cards in your soul, you may pay the cost. If you do, draw 1 card, and SC1. AUTO R: [Choose 2 of your “Vrykolakas” on R, and put them in your soul] At the start of your main phase, you may pay the cost. If you do, choose 1 of your vanguards, and it gets Power +3000 and Critical +1 until end of turn. AUTO R GB1: [CB1] At the end of the battle this unit attacked a vanguard, you may pay the cost. If you do, choose 1 of your other units, it gets Power +5000 until end of turn, and lock this unit. AUTO R: When another of your “Seven Seas” units is placed on R from the drop zone, this unit gets Power +2000 until end of turn. ACT [Drop Zone]: [Choose 1 card in your hand with “Seven Seas” in its card name, and discard it] Call this unit to an open R.
ACT R: [Rest this unit] Put the top card of your deck into the drop zone. If that card has “Seven Seas” in its card name, choose up to 1 other card in your drop zone with the same grade, and call it to an open R. At the end of the turn, retire the unit called with this effect. ACT R: [Put this unit into your soul, choose 1 normal unit from your hand, and discard it] Look at the top card of your deck, put it on either the top or bottom of your deck, and draw 1 card. If you have 1 or more face-up cards in your G-Zone, choose 1 of your units, and it gets Power +5000 until end of turn. AUTO V/R GB1: When this unit attacks a vanguard, it gets Power +4000 until end of battle. Bloom – AUTO V/R: When another of your “Southern Wind Valkyrie, Blum” is placed on R, choose 1 of your units, until end of turn, treat this unit as having the same name as the chosen unit. ACT R: [Put this unit into your soul] Choose 1 of your units, and it gets Power +3000 until end of turn.